Did you know…broccoli rabe, or turnip broccoli, is not really broccoli but rather comes from the turnip family? What’s the Story Behind the Super Food? Broccoli is an edible green plant in the cabbage family, whose large flowering head is used as a vegetable. The word broccoli, from the Italian plural of broccolo, refers to "the flowering top of a cabbage". Broccoli is often boiled or steamed but may be eaten raw. Broccoli has large flower heads, usually green in color, arranged in a tree-like structure on branches sprouting from a thick, edible stalk. The mass of flower heads is surrounded by leaves. Broccoli resembles cauliflower, which is a different cultivar group of the same species. Broccoli is a member of the cruciferous family Brassica oleracea, specifically from the Italica cultivar, and is closely related to cabbage, cauliflower, kale, collard greens, and brussels sprouts. There are two main types of broccoli, heading and sprouting. Heading broccoli is by far the most common. You’ll recognize the sprouting type by its stalk with many florets growing from it. Broccoli has been around for at least 2,000 years and was first seen in the region of Asia Minor now known as Turkey. From Asia Minor it spread to Italy and Greece and eventually made its way throughout the rest of Europe. In the early nineteenth century, Italian immigrants carried the vegetable with them to North America. It was not popular with non–Italian Americans and took another century to catch on and be grown commercially. The first commercial harvest was celebrated in the borough of Brooklyn, New York, in 1920. Where Is Broccoli Grown on Earth? Canada, Japan, Hong Kong, Mexico, and the United States are the top contributors to broccoli production. Ninety percent of the broccoli grown in the United States comes from California’s Salinas Valley and Santa Maria. In the winter months, the vegetable becomes available from Arizona, Texas, Florida, and Washington. Broccoli is high in vitamin C and dietary fiber; it also contains multiple nutrients with potent anti-cancer properties, such as diindolylmethane and small amounts of selenium. A single serving provides more than 30 mg of vitamin C and a half-cup provides 52 mg of vitamin C. The 3,3'-Diindolylmethane found in broccoli is a potent modulator of the innate immune response system with anti-viral, anti-bacterial and anti-cancer activity. Broccoli also contains the compound glucoraphanin, which can be processed into an anti-cancer compound sulforaphane, though the anti-cancer benefits of broccoli are greatly reduced if the vegetable is boiled. Broccoli is also an excellent source of indole-3-carbinol, a chemical which boosts DNA repair in cells and appears to block the growth of cancer cells. Consumption of broccoli has been linked to reduced testicular volume in adult males, though more studies are being undertaken to assess the statistical significance of these results. Getting vitamin C from fresh foods in the treatment of sinus infections is a plus, and broccoli, rich in C, along with other foods (like berries and citrus fruits), is eaten to both treat and prevent sinus problems. Used as a base of various juice blends, broccoli has long been advocated for relieving symptoms of herpes outbreaks. Now some scientists believe they may have found out why. Researchers at Northeastern Ohio University College of Medicine in Rootstown, Ohio, tested human and monkey cells and found that a naturally occurring compound present in broccoli (and other vegetables like cabbage and brussels sprouts), called indole-3-carbinol (I3C), may inhibit the herpes virus from reproducing. Eating foods rich in calcium, such as broccoli, can also help prevent headaches and cramps from the menstrual cycle. HEART HEALTH: Human studies have shown that people with mild to moderate LDL (“bad”) cholesterol levels (and potentially at risk for heart problems) who consumed a beverage containing broccoli and cauliflower juice showed a decrease in LDL levels. CANCER: There are over three hundred studies investigating the health benefits of sulphur-containing compounds such as sulforaphane glucosinolates, found in broccoli and, to a much greater extent, broccoli sprouts, in fighting breast and prostate cancers. Studies have shown that sulforaphane stopped the growth of breast and prostate cancer cells. 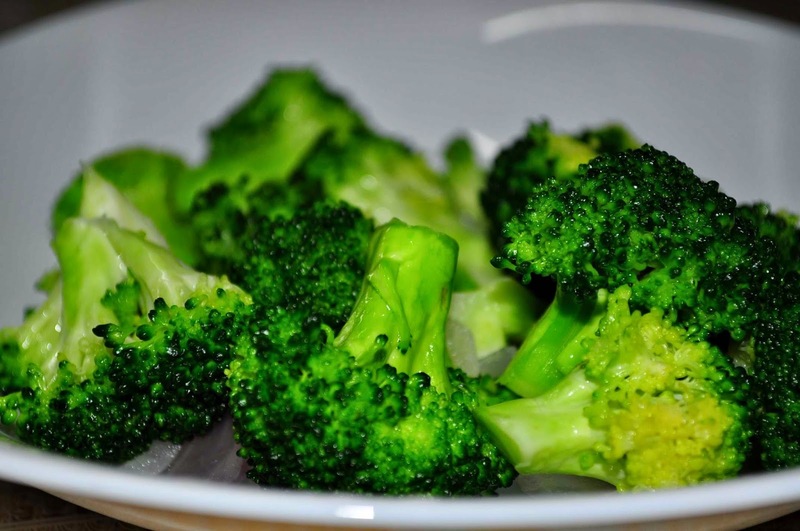 The growth of thyroid and goiter cancer cells slowed when they were treated with sulphur-containing substances in broccoli called indole-3-carbinol and diindolylmethane (DIM). ULCERS: Sulforaphane in broccoli may prevent the growth of H. pylori bacteria, often attributed to causing stomach ulcers and other ailments. Even strains of bacteria that have been found resistant to antibiotics were effectively reduced in the presence of broccoli. 1) Look for firm stalks and compact heads that are dark green in color. 2) Place unwashed broccoli in an open bag in the refrigerator or in the crisper drawer. 3) For best taste, use the broccoli within one to two days of buying. 1) Cut off the thick stalk. If you don’t care for the fibrous outside layer you may use a vegetable peeler to remove it up to the florets. Cut the florets and stems into spears. 2) Cooking broccoli may increase its cancer-killing properties. Researchers at the University of Illinois found that when broccoli was heated, the number of sulphoraphanes that fight cancer was enhanced. 3) Steam broccoli until it is fork-tender but still crisp. It should be bright green in color. 4) Stir-fry broccoli with carrots, snow peas, chicken (or any animal protein or vegetable protein such as tofu), and soy sauce. 5) Eat raw with your favorite dip or in a salad for added flavor.